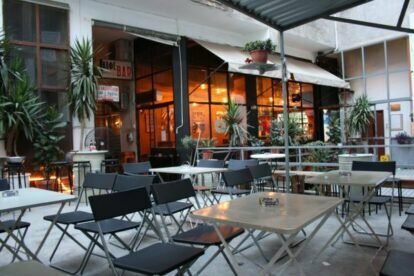 This is one of my favorite places in Athens, so beware! Cantina Social is a bar that actually never made any publicity for itself other than word-of-mouth and surprisingly you won’t find the name printed anywhere either. The existence of a bar in this empty space between buildings can be acknowledged by two ways: the indie-music that always catches your attention and a small sign on top of the door of the tiny bar stating ‘café-bar’. The interior decoration of Cantina Social is very simple and yet very interesting with the mirror-lamps hanging from the ceiling being the number one decorative attraction of the bar. The prices of the drinks are kept (for Greek standards) deliberately very low and all sorts of beer served come from Russia! Ah, and if you get hungry don’t be shy, just ask for a sandwich and you’ll get it for free. Also check the posters hanging on the walls outside the bar for exhibitions that take place in the bar from time to time.